They don’t hug people they just met. They don’t play louder when confused. They use plain language even when they listen. Wisdom doesn’t come to every Californian. will die with difficulty in the dark. why not look in the mirror? with those marigolds you forgot to water? Tony Hoagland’s poems interrogate human nature and contemporary culture with an intimate and wild urgency, located somewhere between outrage, stand-up comedy, and grief. His new poems are no less observant of the human and the worldly, no less skeptical, and no less amusing, but they have drifted toward the greater depths of open emotion. 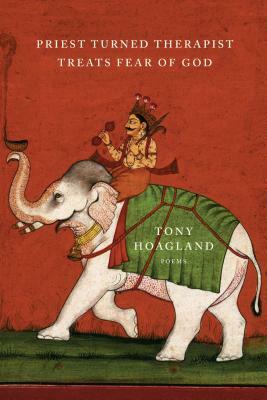 Over six collections, Hoagland’s poetry has gotten bigger, more tender, and more encompassing. The poems in Priest Turned Therapist Treats Fear of God turn his clear-eyed vision toward the hidden spaces—and spaciousness—in the human predicament. Tony Hoagland is the author of five previous poetry collections, including Application for Release from the Dream and What Narcissism Means to Me, a finalist for the National Book Critics Circle Award. He lives in Santa Fe, New Mexico.